It’s another of those weeks when we pause from my endless stream of flowery prose and let the pictures do the talking. While I know some of you have read all 6,626 words of the Langtang trip report I posted in April, others of you prefer just to watch telly. Luckily for you people I also cobbled together some extremely professional video footage, using state-of-the-art sound effects to make the wind drown out the sound of my voice, vibrating tripod to make the picture sway like a boat in the choppy ocean, and voice over by some drunkard with a funny Yorkshire accent, all stitched together into short 5 to 10 minute films using a pair of my grandmother’s best knitting needles. I have nearly an hour’s footage in total from our trip. If you want to see the whole lot then you can watch the complete playlist (it beats any number of cookery programmes available on TV tonight), but here’s just a sample selection to whet your appetite. We started our trek by walking through Helambu, a region of mid-altitude forested ridges immediately north of Kathmandu. The ridge from Chisapani to the Laurebina Pass, which crosses over into Langtang, is wide enough to accommodate villages, thick forest and open meadows. The trail weaves along it, sometimes looking to the east, sometimes to the west, and sometimes the ridge narrows to give views on both sides. When the view opened to the right, the snowcapped spires of Ganchenpo and Langshisa Ri, and the broader Dorje Lakpa were visible up ahead. There was evidence of earthquake damage all along the route. Many teahouses have now been abandoned, but there are still sufficient facilities to make teahouse trekking straightforward. This section is notable for its peaceful rhodendron forests, and there is a memorable viewpoint called Helambu Hill above Tharepati at the northern end. This video shows clearly the difficulties trying to say the phrase “wooded ridges” at high altitude. Over the other side of the Laurebina Pass is the Langtang Valley, which is a narrow, forested gorge in its lower reaches. It rained all day, during our first day ascending the bottom of the valley. This changed to deep snow on subsequent days. 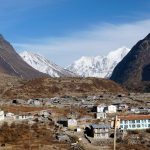 Langtang suffered severe damage during the 2015 earthquake, and it’s not difficult to see why. The valley is narrow and steep-sided, with sheer cliffs rising from ground level. There is much loose rock, and landslides and rockfall are common even without earthquakes and aftershocks to trigger them. The narrowness of the valley in its lower section means there are no places that are safe from rockfall. We passed through Langtang Village during our ascent of the valley, where over 200 people were killed in a rock avalanche that was simply mind-blowing in scale. The village was buried under snow during our ascent, and we didn’t fully appreciate just how devastating it must have been. We understood this in no uncertain terms on our way back down again (in one of the later videos), by which time the snow had melted. There is a certain amount of confusion in this video about whether monkeys eat bamboo or grass, and whether grass grows on trees, so I would welcome any expert who can confirm. Edita’s technique for crossing bridges should not be copied by novices. 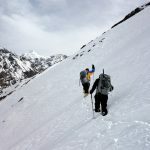 In between our trekking, we squeezed in a winter ascent of Yala Peak, a 5,530m trekking peak that in normal conditions is little more than a challenging scramble. The deep snow meant that we had a harder time than normal just getting to base camp. We needed to traverse steep snow slopes for almost an entire day, breaking trail as we went along, with a big drop below. It was tiring and took much longer than we expected. It wasn’t helped by the fact that we were often falling up to our thighs in rock crevasses – gaps between giant boulders that were hidden by the deep snow. Unfortunately my camera batteries were frozen on summit morning, and none of our ascent of Yala Peak is captured on video, but the footage that follows hopefully makes up for this. After traversing beneath the summit rock tower, a knife edge snow ridge and a wall of snow led onto the summit dome. We fixed a rope to get up this section. 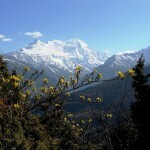 Yala Peak is not a high mountain by Himalayan standards, but the ending is special. 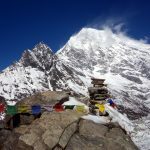 It is as distinct a summit as any other I’ve climbed, and it’s a fabulous viewpoint, surrounded by snow peaks of all shapes and sizes, divided by sweeping glaciers. There was also one big surprise peeping up on the horizon. This final video covers our descent back down the Langtang Valley after the snow had melted. From a winter wonderland at the top end of the valley we descended to the utter devastation of Langtang Village (or what remained of it) in a matter of hours. After camping for a night beside a somewhat alarmingly positioned teahouse, our trek ended with a classic Himalayan trail, high above sparse rhododendrons woods, with a river crashing hundreds of metres below us in the valley floor. We found a wonderful campsite, Polche Kharka, looking west to the peaks of Ganesh Himal, from a high meadow perch. It was a great way to end a very satisfying trek. Oh Mark! There are no words! I have always preferred a book or written story to a movie, as the latter restricts the imagination. But this video shows us the reality of a story that captured our hearts after the earthquake. Thank you So much for making these videos and written reports. Hey! Nice cake at the end. Congratulations! Trekking in Nepal is one of the best things in life! Really enjoyed the videos. Music well done too. You’ll produce your next vid during your winter k2 ascent? Really loved the music to the Langtang valley trek. What a superb video. I have no idea why the monkeys are in the tree eating grass, by the way; in India, they eat crisps. At ;least, in my experience, if I have crisps, they eat them.